Quinlee Weatherford, a fifth-grade student at Hermosa Elementary School, spells her way to a Hermosa Spelling Bee championship on the winning word, “onion,” Wednesday afternoon at the school as runner-up Josiah Deason, a third-grader, looks on. 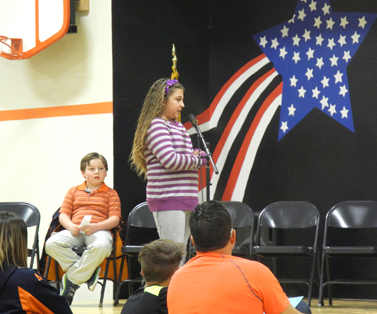 A total of eight students in grades 3-5 participated in the bee, which went 12 rounds. Weatherford is a student in Krystal Craft’s class; Deason is a student of Delma Lopez.